What It Is: An all-in-one beermaking kit that promises to make better quality brews in under half the time of a conventional homebrew kit. The Beer Machine is a customizable microbrewery for your home; featuring a custom pressure gauge to help you keep on top of the brew quality, fermentation level, carbonation and more, as well as taps for when you’re reading to share your spoils at your next beer bash. The initial kit comes with a starter for your first batch of homemade beer, but the company that sells The Beer Machine also has dozens of varieties of unique starters to suit your tastes. Who It’s For: Your dad, because Father’s Day. Your husband, for his man cave. Your brother, for his new home. What It Costs: The Beer Machine starter kit retails for $119. 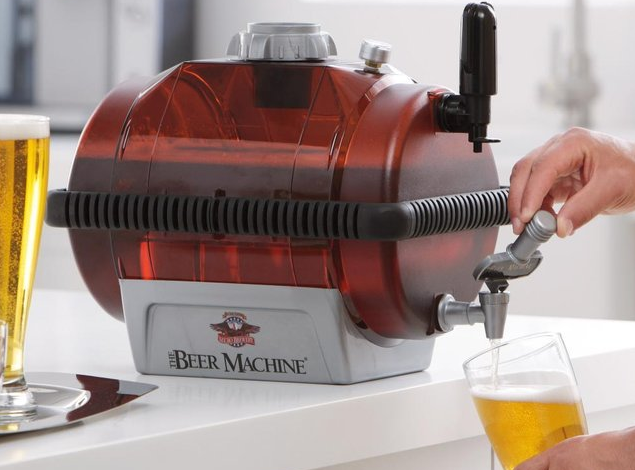 Where It’s At: The Beer Machine is sold online. Bonus entry into my Lazypants giveaway: tell me in the comments below, would you or someone you know love this beermakers’ special? As a heads up, my Lazypants post has been updated to include some fab new imagery + the new Lazypants site is now up & running for your shopping pleasure. Enjoy! My husband is a rel beer affectionado. I would definitely buy this. Great find!! My husband would love trying this out and making different kinds of beer..
We got one of these last year for Christmas….totally put us off of home made beer. This would be an awesome gift for father’s day. My dad isn’t a big beer drinker but I have friends who would die for this! My brother would love to make homemade beer! My son would love this! I’ll be earmarking this site for Christmas. My husband would like to get back into home brewing and this machine looks easy. I wouldn’t use this, but my son might. I would love this! Beer at home! I would! My dad probably doesn’t have time to make beer right now, but he’d enjoy the results. my husband would love this, i wouldn’t!